Group photo of Hydrographic seminar for the OTs. Montserrat is participating in a five-day seminar to build capacity and support safe maritime trade and economic growth in the Overseas Territories. 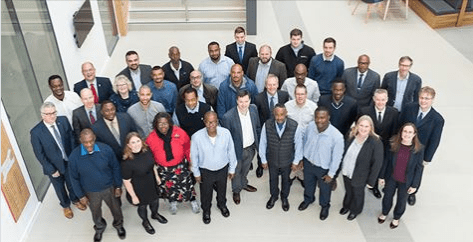 The UK Hydrographic Office (UKHO) is leading on the seminar with support from Maritime & Coastguard Agency, are working with representatives from 10 Overseas Territories, including Montserrat, to support maritime trade within their waters. Joseph O’Garro of the Montserrat Port Authority, Alwyn Ponteen of the Fisheries Dept and Eulyn Silcott-Greaves of MAHTLE are representing Montserrat. For these ships, this information, including up-to-date bathymetry (seabed mapping data), navigational warnings and observations, is essential to safe navigation. And with the global ocean economy expected to double from $1.5 trillion in 2010 to $3 trillion in 2030, it’s vital that these Overseas Territories develop their capability to not only support maritime safety, but create opportunities to increase seaborne trade and tourism. This is particularly important for the many Overseas Territories where these sources of income make up a significant part of their GDP. This activity, including both the seminar and surveying, has been carried out under the UK the Conflict, Stability and Security Fund Programme funded by the UK Government. This hydrographic seminar provides a unique opportunity to assemble an array of delegates from across the world, with a shared vision for using marine geospatial data to unlock safety, prosperity and sustainability. Work that has been undertaken as part of the Overseas Territories Seabed Mapping Programme to date has shown the benefits of marine geospatial data. The next step, in terms of implementation, will see tangible returns on hydrographic investment. In the short and medium term, we expect new charts to be created with a higher level of detail than ever before, ensuring safety for mariners and providing businesses within OTs to begin planning for increased import/exports and even infrastructure development and coastal protection. In the long term, however, what this work will foster – spurred by this week’s session – is a shared culture of hydrographic excellence across the Overseas Territories, unlocking a marine geospatial-led future that maximises the potential of these territories’ blue economies.